Eating in Disneyland is always an adventure. We have specific must haves on every trip we take. Mickey Ears pretzels, Mickey ice cream sandwich, Mickey Caramel Apple (darn I missed out this trip). And certain places we like to eat. The pizza at Naples is delicious, and of course, although a bit on the expensive side, we like Goofy’s Kitchen. On our recent trip to Disneyland, we had dinner our last night at Catal restaurant in Downtown Disney. We had spent nearly all day in the park and as it was Spring break, the park was full of people as were the restaurants in the immediate vicinity. Steve called around and found a reservation at Catal. We were seated at a table on their outside balcony overlooking Downtown Disney. After perusing the menu, I finally decided to order their Chicken Paella. 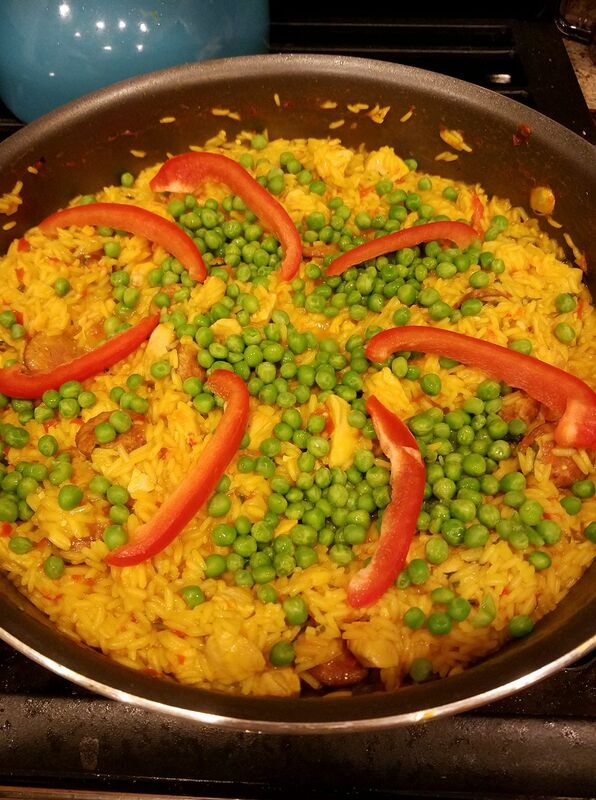 I have not had Paella before, however I have seen it made on different cooking shows and I know it is made somewhat like my favorite Italian dish, risotto. It was served in a scorching hot, cast iron paella pan. I enjoyed it so much I was determined to try it myself. My biggest concern is that I didn’t have a typical paella pan. I have since learned that you can cook paella in a frying pan, however paella pans or cast iron frying pans are preferred. 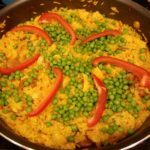 Paella pans are intentionally shallow to allow the rice to cook in a thin layer. Cast iron also seems to be highly preferred as it allows for the crispy layer on the bottom. Also I discovered of interest is paella is traditionally cooked outside. Combine chicken broth and saffron in a medium saucepan and bring to a simmer. Do not boil. Keep warm over low heat. Rinse and pat dry the shrimp with a paper towel and set aside. In a large paella pan or skilled, heat 2 tablespoons of olive oil over medium heat. Add shrimp; saute for 2 minutes. Season with salt and pepper. Remove from skillet saute for 3 minutes, stirring occasionally to keep from burning. Remove from skillet and set aside. Add chicken to the skillet and cook for 5 minutes, stirring occasionally. Add onion and red bell pepper, cook for 5 minutes. Add garlic, cook for 1 minute. Add rice; cook for 2 minutes. Stir in hot chicken broth, cooked chorizo, tomatoes, lemon juice, paprika, and parsley. Reduce heat to medium and bring to a simmer. Cook stirring frequently for about 10 minutes until the rice as absorbed most of the broth and is almost tender. Arrange cooked shrimp over the rice (optional). Scatter the peas over the top of the rice. Reduce heat and cover with a lid and cook for 5-10 minutes. Removed from heat and let stand for 10 minutes. Garnish with red bell pepper slices.